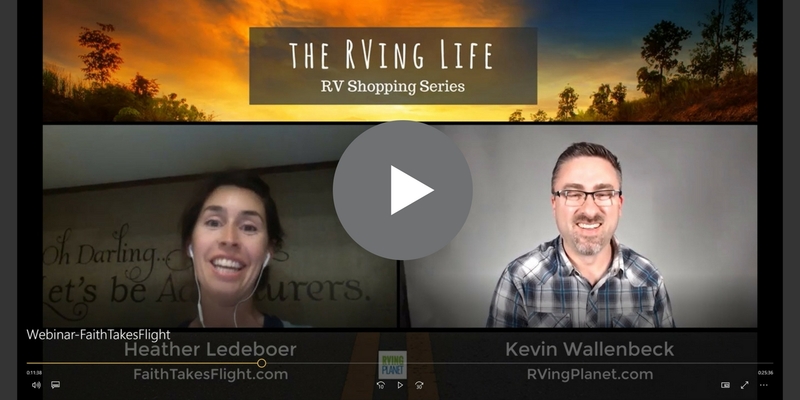 Welcome to the seventh episode of “The RVing Life Show”, where I interview Heather Ledeboer of Faith Takes Flight. 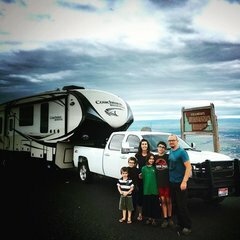 In September of 2015, after selling most of what they owned, the family of 6 hit the road in a fifth wheel to go full time RVing … and have not looked back. Tips to go about searching and locating the RV fit for your family. Extra advice for parents shopping for an RV for the whole family. FaithTakesFlight.com – Keep up with the adventures of Heather’s family of 6. Budget Saver’s Plan – An easy to follow step-by-step action plan guaranteed to give you the knowledge you need and confidence you deserve as you buy your next RV. Top 5 Best Travel Trailers for Large Families – Everyone needs a vacation. But packing up the family can be just as stressful as your 9-5. When it’s time to pack up the kids, their friends, and the family pets you need space! There are plenty of travel trailers that will squeeze you in, but on vacation you need to be comfortable and relaxed. 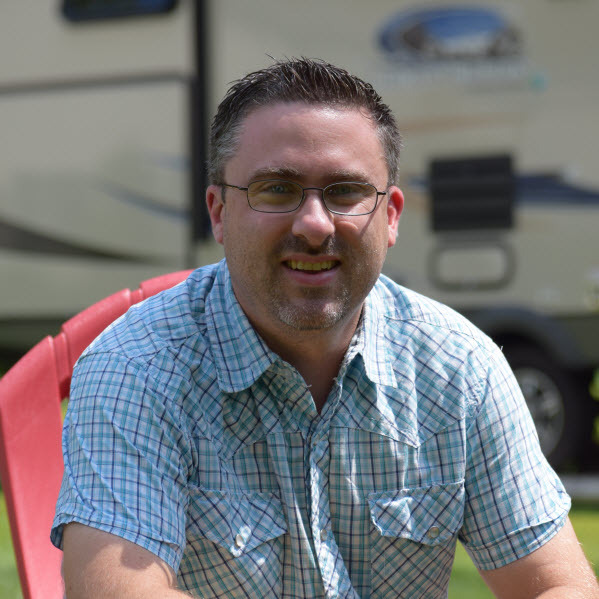 The RVing Life show is recorded weekly, featuring the encouraging stories and helpful experiences of current RV owners and those aspiring to enjoy the RVing lifestyle. Viewers tune-in each week to learn lessons, take away actionable steps, stay connected and most importantly … feel supported, empowered, and encouraged! We are currently looking for current RV shoppers and owners to share their shopping and ownership valuable tips and strategies viewers can implement in their own RV buyer’s journey. Click here to apply today! Not ready to be a guest yet, but know of someone who might be? Suggest a guest here. Intro: Welcome to another episode of The RVing Life Chats, bringing the best of RV and RVing gear shopping tips to you directly from the mouths of experienced, been there done that RVers. Today’s show is sponsored by RVingPlanet.com. And now here’s your host Kevin Wallenbeck. Kevin: Welcome everyone to the next episode we have today of the RVing Life and we’re going to get right into it with Heather Ledeboer. I got that right, Heather, is that right? Kevin: Alright, I did it right. Heather Ledeboer, and she and her husband are dreamers. In the last few years they found their big dreams leading them the question what they considered normal. This led them to make a series of changes in their lives that culminated in the sale of their comfortable five-bedroom home on Five Acres, they sold a percentage of what their family owned, stored the rest and purchased a fifth wheel RV to travel in full time. Family of six has now been on the road since 2015. And their perception of our normal lives has been permanently altered. They couldn’t be more excited about what the things they are learning about themselves and the people they are meeting along the way. So Heather, welcome to the show. Kevin: Yeah, we’re so glad to have you here. I know Trent wasn’t able to join you today, but I’ve looked on your website which we’ll mention here in a little bit and looks like you guys have been pretty busy as of late. Kevin: But so tell us what you’re up to, kind of what you’re doing as a family, and where you are now? Heather: Well, currently we are in Williamsburg, Virginia and we are moving our way up the East Coast this year. When we started out on this trip we didn’t have a specific entity in mind, we committed to a year and then we figured we would sort of reevaluate along the way. And once we got to that point we would see with the option of continuing if we wanted to, but we figured not knowing for sure how long we would be doing this. We wanted to start with the part of the country that we hadn’t yet seen as a family. And so being from Idaho and we’ve had family in Southern California and in Minnesota and Tennessee we’d had multiple opportunities to take road trips to see those family over the years, and but we’ve not been east of the Mississippi. So we thought why not take some time together as a family? So we wintered in Florida and then we’re working our way up the East Coast this year and kind of coordinating that with our study of early American history for homeschooling and it’s been a really wonderful unique opportunity to match those two together and just explore new places together and be learning about stuff where it happened, it’s been a really memorable opportunity for us. So that’s where we are and why we’re headed in that direction that we’re headed. Kevin: That is awesome. I know we haven’t gone full timing in our RV yet, but we’ve been out to eastern part pretty much like Gettysburg area for a few weeks at a time, done a bunch of exploring of the Civil War stuff, and I was really … one summer we took a couple of weeks and tried to do Revolutionary War, and we were very surprised, there’s a hundred years difference between those wars. The difference in like artifacts is quite different. Kevin: Yeah, I didn’t just … I never thought of it, and so you kind of experience it. So that’s fantastic. So you guys have been traveling since 2000, the fall 2015, is that right? Heather: No, it was actually this time last year is when we purchased our RV. Heather: And we lived in it … 16, yep, and we lived in it stationary for the first few months and then we launched on so to speak in September. And that’s when we were on the road moving in new places on September of last year. So we’re over half a year into it now. Kevin: Yeah, so there are a wide variety of people listening to what you’re talking about tonight or tis afternoon, and they’re going to range from someone who’s never owned an RV before to someone who’s been full timing in RV for 20 years, right? So it’s just amazing to me … there’s probably a limit, but it’s amazing to me how many different reasons people buy RVs, right? Kevin: So tell us why, because people don’t have to, right? I mean, an RV, it’s not like a car where … there’s the buyer’s journey of someone buying a car is about five steps long, there’s multiple steps underneath that. But there’s six steps in an RV buying journey and that first one is do you even want one? So talk to us about do I even want one? I mean, what was it like for you guys, your thought process, and just at the beginning stages of thinking about getting one. Heather: Sure. Well I think a big factor for us was identifying the fact that we love to travel and we wanted to do more traveling as a family. But what that could look like really depends on a variety of factors. So we would love to go on a sailboat, we would love to travel internationally, we would love to travel within the US. But for us at the current time that our family has younger kids, our youngest is 5 and our oldest is 13, and we have a 7 and 11-year old in between, we felt like starting in our own country would be a great place to begin. And because particularly younger kids and the personalities of a lot of people in our family being introverts and needing kind of a place to be able to recharge at the end of the day, we felt like an RV would be a good mix of being able to have a constant home but open adventure. So we could go out and we could explore Williamsburg today and be gone all day long, and then we could come home and I knew what was in my fridge for dinner and I knew that we were going to have a relatively regular evening routine, we could do stories and we could do bedtime. And we could choose if we wanted to to have that same structure repeated day after day in our home, but we can choose where we take our home and what we want to do with our day. So it’s harder to do that in international travel which I still hope that we will get a chance to do someday. And we’ve done a lot of road tripping where each night we were in a hotel in a different place. And that can be fun but it’s not sustainable for us long term. And we wanted to try to find something that could fit that need of being sustainable that we could find a rhythm that would still work for our family and not feel like it was a constant vacation, but feel more like that we could actually live within this rhythm. So that was a big initial factor for us in saying an RV is going to fit that best in this stage of life for us. Kevin: So you mentioned something interesting that I hadn’t thought too much about before, but whether you’re living in a full time like you guys are or whether you’re the one to two weeks at a time type RVer, right, takes off for a week’s vacation or two weeks’ vacation, you mentioned going to Williamsburg, so even the person who’s going for a week or two can still have that same kind of experience of going but yet coming back to somewhat normal, right, in the evening. Kevin: I thought about it exactly that way before, but that’s a great way to think about it. Very cool. Heather: It’s nice to be able to take your home with you and just choose what your view is. Kevin: That’s right. Take your home with you. We call it … we talk a lot on the show, at least we have already about the idea that an RV being a home on wheels. And that’s fun to say, it also has a lot of challenges to go with it, right? Heather: Yeah, sure, that’s yes. Kevin: For sure. But I know, I’m sure you wouldn’t … if you want to give it up you probably would have by now. So you’re obviously enjoying it with the challenges and all. It’s worth it. Kevin: Alright, cool. So when you guys started looking for an RV you mentioned you bought about this time last year. Was that the first one you’d ever owned? Was that a whole new experience for you guys? Or had you done that before? Heather: It was the second RV that we owned. We had purchased a travel trailer probably like around 20 foot or 24 foot or something like that travel trailer that we envisioned camping in. And we did use it for that purpose, but as part of the, like before we sold the house type of thing we started selling off big possessions and that was one of the first things to go. And so then we traded in for a tent and we tented for a while and really enjoyed that. Heather: Just for our weekend camping trips and that kind of thing. So it wasn’t brand new to us which helped a little bit, but we certainly, we hadn’t done it very often and we had not taken it far. It was just local within a few hours from our home that we would take it just to kind of get a chance to get away from home and force you to stop working for the weekend, that kind of thing. But we hadn’t taking it cross-country or anything big like that. Kevin: Yeah, so I’m sure if we ask Trent, your husband, this next question he would probably have different answers for it. But you’re a unique guest for us so far, so we’re glad to have you on. But as a wife and a mom of four kids in an RV, going from that first one to thinking about that second one, knowing that you’re going to be living in it, right? When you guys decided to purchase a second one you knew that was the plan, right? Kevin: Okay, so you knew that. But what do you think were some of the common things that just people shopping for that RV, that difference of owning the first one to going to the second one, what are some things you learned that you can recall about that first one that you may have done different, some things maybe you’re looking for in the second one that may apply to multiple people, whether they’re going to camp weekends or camp long term? We were sleeping … some of us on couches and using the break down the table and put down the cushions as a bed for the kids. And I think we even had at least one child sleeping under that in a sleeping bag in that living room when were in our travel trailer because it was only going to be for like two or three nights max. And so that was part of the fun of it. You were really roughing it because you’re sleeping on the floor or on the couch, and so nobody really minded. But you would mind if that was your permanent, if every day you were having to make your bed up that way and now you have no table and that kind of thing. So there’s certain things that I don’t think I ever used the oven once in our first travel trailer because we’re like, “We’re camping. We’re going to roast hotdogs and marshmallows and cook outside every meal.” And we pretty much did. And now it’s a rare fun treat for us to cook outside; because this is … it feels like … we cook like we’re at home. And so some of those things changed and became just … it’s not that they’re more or less important, it’s just that you have to apply them to your current situation and say, “No, this matters,” where before it didn’t. So it’s helpful to kind of look at your personal preferences versus how often are you really going to use that feature, and sometimes it’s hard to know that but it can be helpful to kind of think through those things ahead of time. Kevin: So you’d mentioned something I think we were chatting a little bit before the show started, and you were talking about your kids getting ready for bed now and it’s in the evening time. So as you are looking for … your children are really like in their teens and then you have some that are little younger, is that right? Heather: Yeah, 5, 7, 11, and 13. Kevin: Perfect. Okay, so was there anything different between those age ranges at all that, I’m just curious, I don’t know if you have an answer for this, I’m kind of putting you on the spot. But is there anything between those age ranges or even friends you have that are camping that as a mom you’re like (a) as I’m looking for my next RV I would be maybe look at this differently because I had different age ranges in kids or does that not really matter too much? Heather: I think it can factor in on … the specific model that we have for instance is a mid-level bunk, which means that we’ve got our bunk room for our kids is in the middle of the RV where oftentimes it would be maybe in the rear end. We went through a friend’s RV that have the same layout but we realized in walking through it that the length of the bed in that slide for that bedroom space was shorter, and it was shorter to a degree that they were not going to be able to keep that same RV for the next several years because they’re probably 12-year old son was sleeping in that bed and he was going to outgrow it eventually. So if your child was younger then you have more space and time in that, but for them that was going to factor in. And for whatever reason thankfully our slide is long enough that my husband can lay on that bed and he could be fine, and so that won’t be a factor. So things like bed space or two of our kids sleep in a loft above that bunk room, and one of them can sit up fully in the loft and the other one kind of has to crouch down. But our 13-year old, he’s not really comfortable up there at all. So kind of taking I think into account the space and the size and how that matches with your child, that can be a factor that depending on how long do you see yourself using this RV potentially, will your child outgrow it, or when we initially were figuring out who would sleep where our five-year-old didn’t go up in the loft just because we weren’t confident that if you had to use the bathroom in the middle of the night that he’d be able to get down the ladder safely or without assistance, and so that was like, “Okay, you don’t get the loft.” But now he’s done it enough that it would be okay. So just kind of little things like that. Kevin: Doesn’t sleepwalking, that’s good. Kevin: That’s awesome. So when you guys were starting looking for your RV, you’d had one before so that probably helped quite a bit. But when you started looking for the one you have now about how long did it take you like from when you started kind of the discovery process to when you made your purchase? Kevin: Ready to stop looking and actually get going. As you guys were going through that process what was your balance of like looking online versus getting in them to actually try them out and feel them out? Heather: When we first started looking we were actually on vacation in Hawaii. And so it was like … it wasn’t an option to go shopping physically in Hawaii for RV, so we were kind of confined to let’s just see what’s available online. By the time we got home we had already like found a few potentials because we were so excited and we thought, “Well, maybe we can meet up with this person in Portland before we drive home to Idaho and we’ll look at their RV.” And so thankfully it didn’t work out to meet up with them because we didn’t have enough knowledge yet to really be ready to make a knowledgeable decision, I don’t think. So that worked to our favor. There was one RV show that we were able to go to and walked through. And then there was one other time that we went to an RV dealer in a different city when we were visiting some friends. And that was very helpful because like you say looking online gives you one perspective but walking through them spatially gives you the other side of the picture of really being able to start to envision yourself in it and in that space and be able to realize, “Okay, this is how narrow the hall is. Or that I can put my arms up in the shower and I don’t touch anything.” And just kind of really kind of putting yourself in that space. And so once we had really done some walkthroughs and it wasn’t even really extensive the amount of time we’ve been in them. I wish … well it worked out fine; I love what we ended up with. But at the time I felt like I wish we could do that more. But then when we went back home and we started looking at things online then we had more point of reference for, “Okay, this picture a 34 footer. Yeah, okay, I can kind of picture what that means,” or we had a better idea I guess of eliminating things that we knew were not what we thought we wanted but weren’t going to work for us anymore or that kind of thing and we narrowed it down. It was during the walkthrough there that we saw a rear living room model and we said, “That’s what we would ideally like.” And that one had a rear living room and then a one bedroom, so it wasn’t set up for a family, but we liked it so much, we went home and we were like, “How do we make this work? Like could we build a bunk in the master bedroom?” And like we were trying to figure out some way to like create this as a possibility. And then later we found out that this was an option as a mid-level bunk, but it was a new option at the time. And so we probably can get into this in a future question, but we ended up buying new and initially we were planning on buying used simply because the floor plan that we felt was going to be the best fit for our family was only available new at that time. And so that made a big difference going through things in person. And in the end when we did end up purchasing we actually didn’t physically step into the RV until the day that we were going to pick it up to buy it. We had never walked through it in person, but we had walked through enough other RVs and then we saw this one on online and watch YouTube videos and we said, “Yup, that’s the one we want.” And so ironically we never even walked through our own RV till it was ours. But when we got there it was what we expected to because we’d kind of … we’d seen enough that we kind of knew what we thought we’re getting, so it’s like created that match. Kevin: Well, that’s good. There’s actually … I was looking online the other day I think there’s actually … RVingPlanet.com is one of our sponsors of the RVing Life Show, and on their site they actually have all of the new RVs, like 2017, you can go there and look for just about anything. But there’s like 8,000 different models of RVs. And that includes everything from motor homes to pop-ups and everything in between, toy haulers and travel trailers, fifth wheels and truck campers and all that. But literally 8,000 different floor plans, and for those of you that are watching that haven’t done a lot of RV shopping or looking at, and I’m sure, Heather, you experienced this as well that what type of … What brand did you end up purchasing if you don’t mind saying? Heather: We have a Coachmen Brookstone. Kevin: Okay, Coachmen Brookstone. So the Coachmen Brookstone, do how many floor plans actually were available for that brand? Heather: At that time that we purchased do you mean? Kevin: No. So it’s not uncommon to have anywhere from like five to ten different, right, different floor plans of each brand? So and what happens is when people go out shopping like on dealer lots and they go to even RV shows or they go to dealers’ websites, which they should, but even some of the classified sites out there, the challenge is is that the manufacturer may have ten different floor plans just like you were saying they have this certain one. So but that not might be the most popular ones that they’re selling so they don’t stock those. So when people show up in the dealership to look they’re limited in some regard by what’s there. And it’s fair business, I mean, the dealerships are not being deceitful in anyway, they’re just trying to sell what’s popular. But there’s this whole other world of RVs that don’t even show up in the dealers’ lot sometimes that the dealers can order for them. But it just, you mentioned that one floor plan, that rear living, so you ended up with a rear living and a mid-bunk, is that right? Kevin: That’s a pretty interesting floor plan actually. Heather: Yeah, the people like it because when you’re living in it all the time and we home school and stuff we can all sit around together on the couches in the evening and read or watch a movie and it feels more like a comfortable home living room and you typically don’t get that if there’s a bunkhouse in the back, you’ve got more of the split kitchen, couch kind of set up. So it works good for us. Kevin: Yeah, that’s very cool. Awesome. Very good. So just as we get finished up here I took out … not took out, I took a look at your website FaithTakesFlight.com. And I know that you’re very passionate about your faith, I really respect that. Tell us what FaithTakesFlight.com is about, like why did you start that blog, and what kind of things do you post there? Heather: I started when kind of I mentioned earlier in the show when we first started selling our first RV and selling things off. We were in a position where we felt like we wanted to become more available for whatever we felt like God was putting in front of our family. And so for us that meant that we needed to free up ourselves from things that might hold us down. In the Bible there is a verse that talks about running with perseverance for the goal marks before you and throwing off anything that easily encumbers you or holds you back. And so I think the things that for us we felt applied and that will be different for everybody because God calls different people to different forms of service and in different places. But we wanted to be able to be less weighted down by our possessions. And so that process started out with first just lightening our load and selling off things that we didn’t need but maybe … and we weren’t even really using or that were holding us back from something else that could be greater. And so that looked a little different when we were selling the house and I was trying to decide what to sell and having a hard time with that pull of like, “Is this possession possessing me? Because I’m having a hard time letting go of it.” Where now it’s more like, “Okay, we just went through this battlefield and here’s what I learned in seeing something on the battlefield, this is how it applies to my life now.” And so I think for all of us we’re given every day an opportunity to learn something from the experiences that are put in front of us. Just what that happens to look like for us right now is in a mobile format that we’re learning as we go. But I think just having that faith to step out and say, “I will let go of what’s familiar and embrace the unknown, because I know that God is leading me and he won’t let me fall.” It’s just sort of that the concept of I guess behind the name and in what I like to write about. Kevin: That’s very cool. And I’ve read a little bit of your writing and I mentioned this a little earlier too before the show started, but I really enjoy your writing style and I think a lot of people will. We’ll have the the link FaithTakesFlight.com in the show notes down below so people can easily find that website there and I know they can connect with you there as well. You also have, tell us a bit about the 50 State Book List, what is that and how can people get that? Heather: That is the list that I compiled when we first were getting ready to launch. And as a home school mom and a previous elementary school teacher and just a lover of literature in general I was thinking, “You know there’s an opportunity that we have as we travel that I might miss if I’m not intentional about this.” And that’s the fact that there’s some really great books out there that were written in a particular place and wouldn’t it be cool to read that book before we go to that place or while we’re there or right after we leave, because now we’ll have like this personal connection not only to the story but to this location. And so I thought it would be said to miss out on that and find out like months later, “Oh, we were here and this book was written here.” And that kind of thing, so I thought I wanted to do some some work ahead of time and compile a list according to state and I was just going to do it for myself initially, but then in speaking with some other full time RVers at home school I realized that it was something that probably more people would appreciate having access to. And so it was an all consuming project for a while, but it felt really fulfilling to be able to get an alphabetical list compiled with several books for every state. And a lot of them are historical fiction, but not all of them, some of them are like something like Charlotte’s Web or something and like just the state that it happens to be set in is in a particular state, and so then you can tie that in if you want. And then others are more specific. And so my daughter and I just read a book called Bluebirds that is about the Lost Colony of Roanoke in North Carolina, and we were just visiting there and it was super cool to be able to have this relationship with the place and you’re envisioning it in your mind while you’re reading about it and then it’s kind of like a refresher in the historical story but then now it had this deeper meaning, and so that is fulfilling. And where we’re headed next is … I don’t even know if I’m saying it yet correctly, but on the island of Chincoteague in Maryland. There’s a book called Misty of Chincoteague and it’s based on a true story of these wild ponies that arrived in the island through a shipwreck event. And so we have two chapters left in that and tomorrow we’re driving there and they’re still wild ponies there and every year they do this pony penning day and stuff and that’s talked about in the book. So basically that was my hope to be able to combine our love of literature with our love of travel and make it accessible to others too if they had any interest whether or not there are being full time or will ever see these places sometimes. It’s just kind of fun to have a purpose in the literature that you choose and that kind of thing. Kevin: Yeah, it draws … It draws a lot of context, right, to what you’re doing. I mean something that we’re not perfect at it, well, I haven’t compiled a list and we don’t always travel in the RV and go to places where I do this. But I like to look ahead. It’s really easy even with Wikipedia and some of the things. We have as a family we have this thing about going to small towns, we just like small towns, they’re cool. And whether it’s for shopping or cool places to eat or just to watch people and talk to people and get to know them. And just looking ahead even at the towns you’re visiting and looking at the history of the town or reading about it, they draw so much context for everyone going, it’s like, “Wow.” And you’re driving to the town almost sudden it’s like, “Wait a second. I read about that like that’s that and that’s that hawk tower and so and so erected.” It’s just really interesting. Kevin: They’re like totally pretty. Heather: Yeah, now I’m like, “Oh, I get why they did that.” And the symbolism was very rich and I was like, “Oh, I have someone … I have a deeper level of respect now than before it was just appreciation.” So I think that’s important. Kevin: That’s awesome. So our guests today are getting a little bit more than RV shopping. But I think it’s awesome and hopefully we can have you back on the show in the future. I know you have a lot to offer, a lot to talk about. Heather: I think that’s a great question. A driving thing for my husband and I and I don’t think it always necessarily would have to relate around RVing, but if you’re drawn to travel and if you’re considering RVing I think that … we had decided to look at what’s the worst-case scenario, like if we get into it and we hate it, then we sell it and we go back home and we do what we were doing before. But we’re going to have some funny stories and we’re going to say, “What we learned from this?” That type of thing. I would much rather be accused of making mistakes in pushing forward than realized that I never stroked to achieve anything and therefore I never made any progression, and so don’t be held back by fear of the unknown. For me that’s been something that I’ve been writing about a lot this year because I’ve been reflecting on different things that I almost didn’t do because I was fearful of them. And traveling to Florida was an interesting example and I wrote about that. Of all the different things I was fearful of going to Florida. And we had an amazing time in Florida. And I think for a lot of people the unknowns of RVing can be pretty expensive. But if it’s something that you feel drawn to do, try and educate yourself and overcome those fears through talking with people, through educating yourself, what they’re listening to now is a form of that and there’s a lot of great YouTube videos or watching other families that are doing this and hearing podcasts and things like that, that for us alleviated a lot of the fears because we kept … the more stories we heard, the more repetition we heard and we’re like, “Well, this must be real because everybody says that this was hard and this was hard, but they’re all saying these are the same rewards that they got.” And we want those rewards and we’re willing to overcome those hardships or at least give it a try and stuff. So I think knowing that others have done it and are enjoying it is a sign that it’s possible, and just figuring out if that’s the right fit for you and do the next step. But don’t be held back by that unknown. Kevin: That’s awesome. Heather, you mentioned earlier that you like the written word and you’re really good at that, but you’re also very good verbally. Yeah, so I pretty much appreciate all that you’ve had to share with us today. So I just want to say thank you. And to all of our listeners be sure to check out all the resources mentioned in today’s show, in the show notes below. And specifically are RVing Planet as our sponsor has an RV buyers budget savers plan that helps you make sure your next RV doesn’t become the most expensive lawn ornament you ever owned. With a hundred percent customer satisfaction rating and a 60-day money back guarantee there’s no risk and there’s too many savings tips to mention in this 30-second advertisements, so be sure to go check it out. And everybody that wraps it up for this show. So until next time enjoy the RVing life. Heather Ledeboer, blogger of FaithTakesFlight.com. She and her husband are dreamers. In the last few years they found their big dreams leading them to question what they considered normal. This led them to make a series of changes in their lives that cumulated in the sale of their comfortable 5 bedroom home on 5 acres. They sold a large percentage of what their family owned, stored the rest and purchased a 5th wheel RV to travel in full-time. Their family of 6 has now been on the road since September of 2015. their perception of normal has been permanently altered and they couldn’t be more excited about the things they are learning about themselves and the people they are meeting along the way.